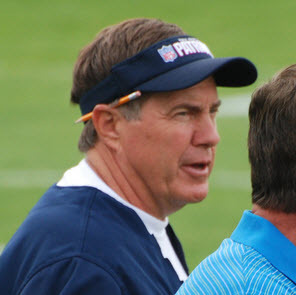 Yesterday's post shared how an analysis of Bill Belichick's hoodie-wearing patterns found no statistically significant difference in New England Patriots wins if he wore sleeved or sleeveless hoodies, nor if the hoodie were from Reebok or Nike. Since these hypothesis tests failed to reject the null hypothesis, I combined these factors under “grey hoodie” and started a new Minitab worksheet. But when I took a look at all the different outfits Belichick wore, there were still too many variables for a good analysis. I then decided to split this category into two: Type and Color. What jumped out was how dominant the Patriots were when Coach Belichick wore a winter coat. The point difference mean was an astonishing 24.5, with their defense holding opponents to an average of only 10.143 points. There were more wins than expected when Coach Belichick wore the color gray (63-15 vs. 58.39 -19.61). When he wore red (or white, for that matter), the Patriots lost more than expected (6-5 vs. 8.23-2.77). In all, this was a lot of fun for Mike and me. But we don’t truly believe that the grey hoodie has any mystical powers. After all, the R2 values above were all extremely low for the ANOVA’s that looked at color. The analyses by clothing type had only slightly higher R2 values. Mike and I hypothesized that temperature might be a more critical X. Belichick’s Patriots are known as one of the best cold weather teams in history. Also, Coach Belichick rolls out his rather complex defensive playbook gradually throughout the year. These may explain the numbers we saw associated with games where the coach wore a winter jacket. Since we had more than enough data for the article, I did not explore anything outside the scope of what the coach wore. There are so many different variables we could have considered, but again, we didn’t want the scope to creep into exploring what makes the Patriots win. I hope you all enjoyed this application of Minitab Statistical Software on this minor obsession of Boston sports fans! Bob Yoon is a certified Lean Six Sigma Black Belt and has been a continuous improvement engineer at Kraft Foods in Champaign, Ill. since 2011. He is committed to promoting and leading continuous improvement in his work and is a dedicated Boston sports fan. Bob can be reached on Twitter at @patscognoscente. Photo by Brian J. McDermott, used under a creative commons 2.0 license.